Welcome to The Lanterns at Warren Woods. Located conveniently between the town centers of Ashland and Holliston, and adjacent to the 475-acre Ashland Reservoir and 120-acre Warren Woods, this neighborhood truly has it all. With a beautiful central Meetinghouse and swimming pool, this is Green Company living at its finest. One of Metro West’s only 55+ condominium communities with 100% detached homes featuring a complete first floor living experience amidst a bucolic setting, walking trails and peaceful woodlands. The Green Company has been creating active living communities for residents in the Massachusetts area for over 60 years. 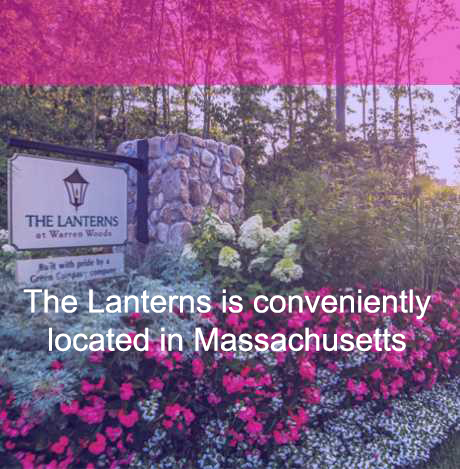 We proudly develop, buildrket andnage residential condominium homes throughout Eastern Massachusetts. Our team has years of experience constructingintenance-free homes for residents from the Massachusetts area that arede for living, notintenance. The locations for our beautifully designed detached homes are carefully chosen for their open spaces, quiet settings, idyllic surroundings, and close proximity to shopping, medical care, and other amenities. Our communities provide convenient homes and locations that are perfect for active adults, empty nesters, 55+, and retired residents. Even though each of our neighborhoods have their own architectural design and look, all Green Company communities share the same features. Our homes let in a lot of natural lighting and deliver an open space floor plan to fit your lifestyle and give you freedom of movement. Our communities are frequently set in elevated areas thaty feature a natural pond, wooded area, or first-rate golf courses. Many of our communities offer walking and biking trails for our active residents. Some also have swimming pools, tennis courts, and even an on-site post office just for them. Our completed neighborhoods range in size from five houses to 550 townhouses. Serenity is another quality our neighborhoods share. We choose parcels of lands removed enough fromjor roadways so that they’ll provide peaceful living for all residents. Our homes are built to last because we incorporate innovative constructionterials and the latest appliances. Not a fan of shoveling snow? We handle snow removal and general landscaping for you. The Green Company wants Massachusetts residents to focus on loving and taking pleasure in life such as spending time with grandchildren and loved ones, developing new friendships, and staying physically active instead of worrying about home repair and lawn care. Inhabitants of our Hatherly Rise community have their choice of seven floorplans in our Fresco and Portico home models. Our Fresco homes, inspired by California design, range from 1,600 to 2,200 square feet. Our Portico homes are available with one or two stories to fit your desires and lifestyle. All of our Portico homes come with a front farmer’s porch and private rear courtyard that give you a cozy outdoor area for relaxing or entertaining loved ones and friends. Enjoy plenty of natural light streaming into your home thanks to a multitude of windows and the open space floor plan. Portico townhouses range in size from 1,500 to 1,900 square feet and feature a front porch overlooking a fence and garden area. Like the Fresco models, these homes still pack a ton of benefits including extra storage space, an open floor plan, and additional living space suitable to use as a guest bedroom or home office. This neighborhood offers its residents their own country style meeting house, swimming pool, and miles of walking trails right beside the Ashland Reservoir and Warren Woods. Lanterns Woods homes give you a choice of a one or two-story floor plan to you can pick the right home thattches your lifestyle and desires. Homes at The Lanterns share a similar design with Hatherly Rise homes in that they offer homeowners roomy space to turn into a guest bedroom or entertaining area, and a peaceful front porch. A number of our homes at Hatherly Rise and The Lanterns are available in move-in condition. All you need to bring is your personal belongings! Although we’re focused on building communities for active adults, we realize that not everyone wants a cookie cutter home. We invite all new homeowners toke your home uniquely yours at our design studio. You have your choice of your cabinets, hardwood flooring, fixtures, countertops, and more. There areny reasons 55+ residents can feel confident about choosing the Green Company other than our carefully chosen locations and professionally constructed homes. We’ve won multiple awards; in fact, our Pinehills community has been awarded more than 20 national and regional awards in the past five years. We completely love what we do for our residents. From our design to our sales team, each and every employee at the Green Company is proud to help residents find a place they’ll love calling home. Since the 1950s, we’ve developed dozens of neighborhoods near Massachusetts. Interested in viewing one of our move-in ready Massachusetts area community homes, or learning more about what our communities have to offer? Call us today to schedule a visit. Massachusetts’ name might come from the Massachusett tribe, whose name can be translated to “near the great hill” or “near the range of hills.” It refers to the Blue Hills, southwest of Boston. The entire Commonwealth of Massachusetts has played a powerful commercial and cultural role in the history of the United States. The state, whose landscape consists of a series of hills and valleys, is the sixth smallest and has the third most people per square mile. Massachusetts population as of 2017 is 6.86 million. Tourism has become an important factor in the economy of the state because of its numerous recreational areas and historical landmarks. The Green Company supports clients throughout all of Massachusetts, including the following zip codes: 02457, 02481, 02482, 01776, 01778, 01702, 01770, 01748, 01784, 01721, 02030, 02367, 02025, 02327, 02358, 02359, 01581, 02050, 02331, 02332, 02340, 02020, 02041, 02047, 02050, 02051, 02059, 02065, 02456, 02458, 02459, 02460, 02461, 02462, 02464, 02465, 02466, 02467, 02468, 02495, 02330, 02332, 02345, 02360, 02361, 02362, 02381, 02532, 02571, 02061, 01778, 01701, 01702, 01703, 01704, 01705, 01746, 01745, 01772, 02459, 02464, 02492, 02494, 01760, 01778, 02482, 02053, 01752, 02018, 02025, 02043, 02044, 02066, 02364. Click here to return to our service area page.